We started early in the morning on the third day at Kiltamany and we were all late. As soon as we arrived at school, we started the meeting with the teachers and tried to get a picture of their challenges: what you do like, why you decided to be a teacher, what you don’t like, what are the problems you see. After few hours we had a meeting with both the community council and the teachers: everything was entirely in Swahili and Samburu language, so I had hard time understanding what they were speaking about most of the time (my Swahili is far from good), but thanks to the patience of my colleagues, I managed to understand everything eventually. 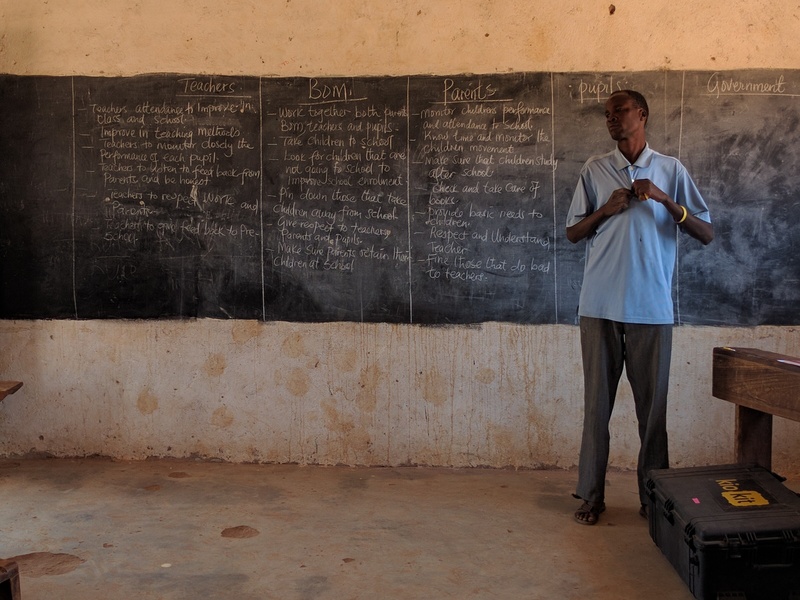 Most of the discussion was almost a fight between community and teachers: each of one of them argued about the role and the other’s responsibilities because of the poor performance of their pupils and children. Long story short, we discovered that according to culture your child either goes to school and performs well, or there’s no need for the child to be in school, so he or she starts working very early in their childhood. If their children don’t go to school, they will obviously perform badly. The teachers are not engaged because pupils perform badly, if they don’t attend class. If teachers perform badly, then the pupils can’t get a good education and, again, they will perform badly at KCPE. Here is the loop you can’t escape, unless everybody takes responsibility. After few hours of discussion, we all agreed to write a list of things that have to be changed and what each of the actors (parents, teachers, community, government) has to do. This was the most difficult (but interesting) part of the day, because it is beyond technology. You listen, you understand, you write a list of things together with all the stakeholders: the community, the parents and the teachers. You compromise and you build an initial framework you can use to make things work. There’s no technology involved, neither is there a product built. From this point you start to think how technology can improve and make things happen efficiently and faster. What we realized eventually was the lack of framework that particular school has and the possible downsides of a product like the Kio Kit. If you deploy where there’s no framework, you need to build one together with the community before even thinking about starting a real pilot or thinking about making a difference. This was the most difficult part of the expedition: how can you convince the community to keep their children in the school? How can parents be sure that their children are not wasting time on a poor (and so useless for them) education? These two questions made us start thinking how we can improve the user experience and the capacity of our Kio Kit to include what some parents want from the education of their children and how we can better track the results of the pupils learning, eventually sharing those with the parents themselves. We want to build a product that can adapt to every kind of situation, even when there’s no framework supporting the education system. In technology projects you must not try to change your customer behaviors, not at the beginning at least, but you must try to properly understand your target before you design the product you want to build. Don’t just think about it, understand it, then design it, then test it and re-design if you haven’t included something. 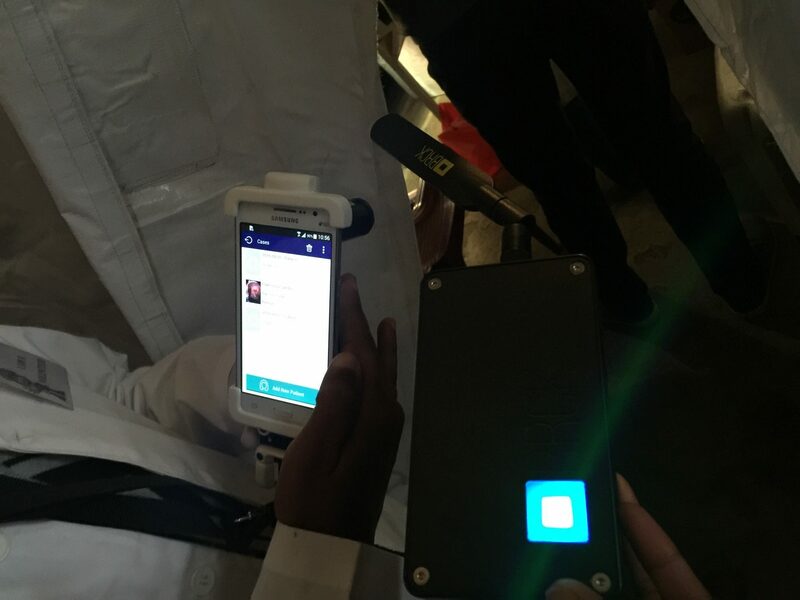 We never thought about an environment like this before, where, for example, the Kio Kit can be shared across multiple classes at the same time or it can be used with an autopilot system because of lack of teachers. Kiltamany is composed of 10 villages surrounding the Samburu National Park. They are far away from the city, in some kind of deserted landscape, with no piped water and no electricity. Kiltamany Primary School is the only school for the whole community, with around 200 students, scarce chalk and studying materials. 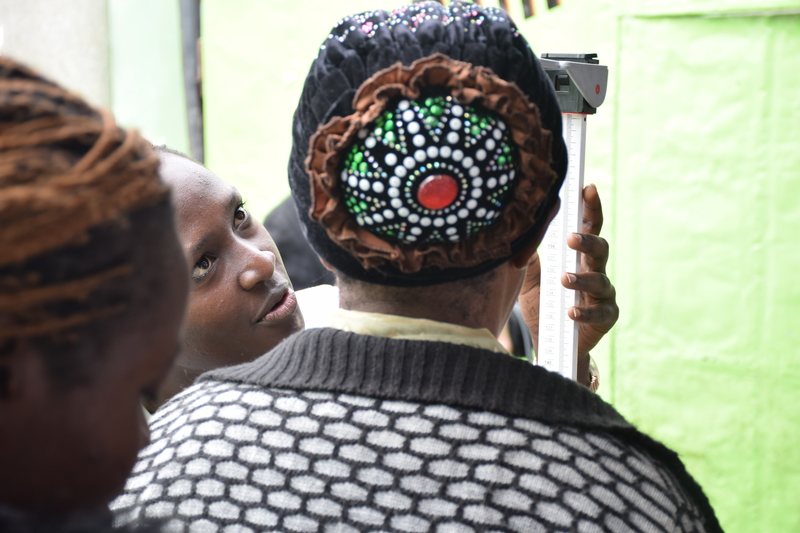 Sylvester, a Samburu Junaenda (in his 30s) believes the school is the hope to Samburu people live their lives better, change the way the community think about marrying early age girls and their practice of genital mutilation. In all, offer future generation broader possibilities. 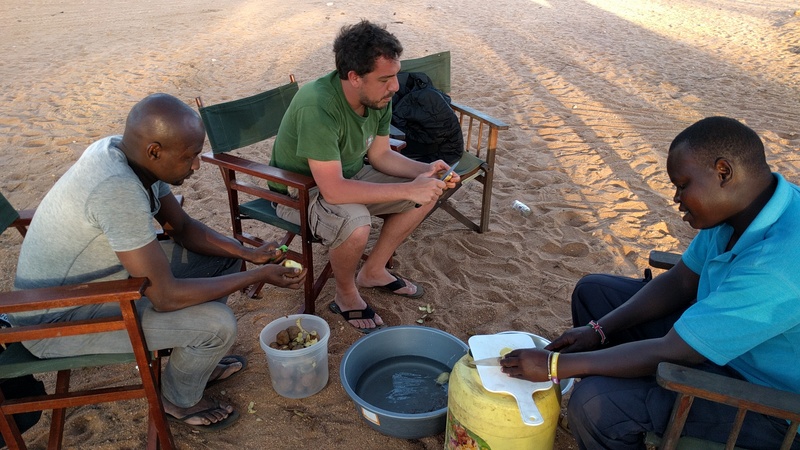 In the Expedition BRCK Team came to Samburu, it was a week of a thousand learnings. 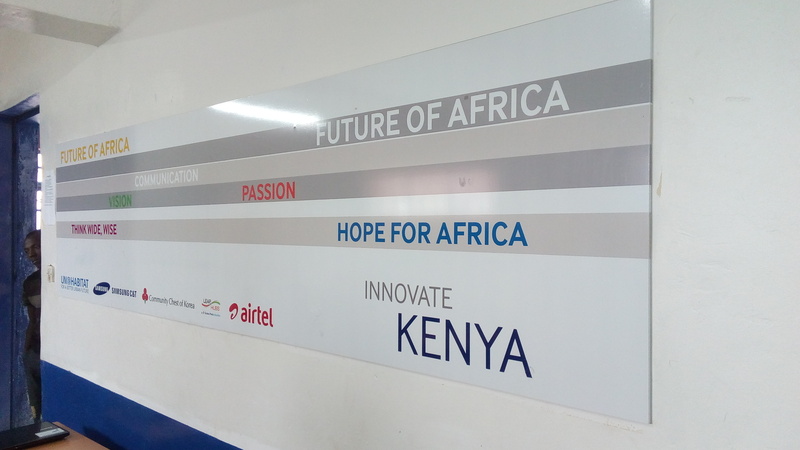 I was there just for the last 3 days, and it was already special: feet on the ground, thoughts on the rising possibilities, hope for the future, hands-on, lots of work to be done. For the three days I was in Kiltamany, there were only 3 out of the 7 teachers present. The School has 8 classes, meaning that on a normal day there is always one class without teacher, and during our time there 5 of the classrooms had no teacher. In spite this, children came every day and were seated in their desks, eager to learn something. Some of them reading or writing, or just doing nothing, until the bell for break ring. This gave our BRCK team an extra job as we were taking turns to be teachers. It was good in one sense, as it put us in the shoes of the teachers (not exactly of course, as I do not have the training nor the content nor speak their languages). I felt the difference of giving one class with the kids holding the Kio Tablets, and another class with no such resources. 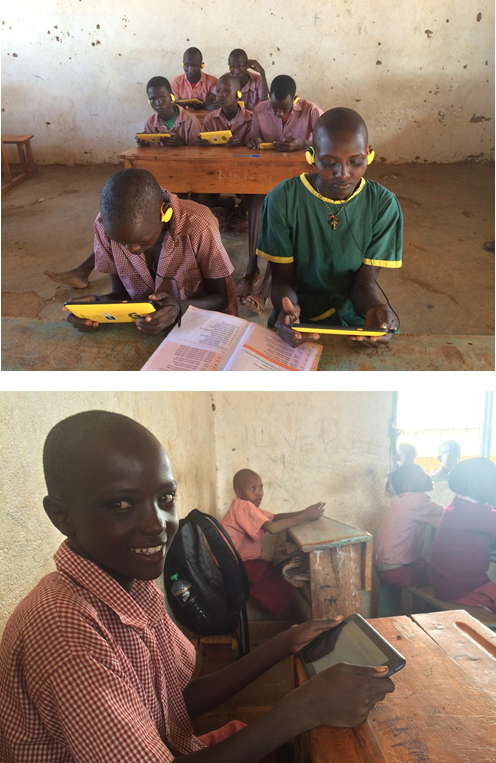 On the other hand, it was not ideal, as it was important to see how the teachers behave with the tablets, if they find it useful, handy, and simple and if it helps in class. 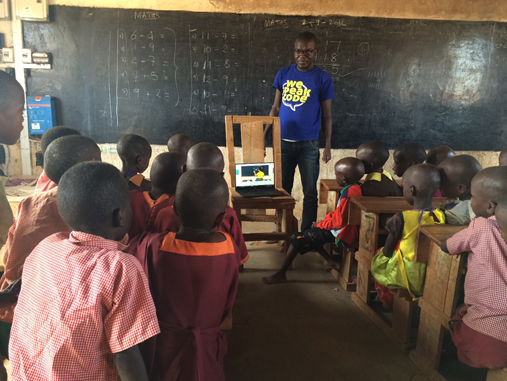 Gordon, from eLimu, was showing the kids their new Swahili literacy app, Hadithi! Hadithi!. Bobo, the app character, was created to do a lot of success among the kids. He tells them story, ask them questions, say enthusiastically his Well done!!! The kids, on the other side, were sited on their desks trying very curiously to get near Bobo, as he was in Gordon’s laptop (as the app is still not in the tablets). They were very excited to participate. Each time one kid went to interact with the screen was the most amazing part. There was a suspense in the air about knowing what response Bobo would give. I went to teach in Class 4 without the tablets and it was a hard job. First my absence of Swahili and the kids’ English. I used a lot of body language and made them come to the board to draw some animals they could see around. They drew lions, sheep, goats, elephants, cows, camels, and snakes. Then, I moved to the body parts vocabulary: heads, shoulders knees and toes. They showed to me that they were learning, and that they knew all the words. However, when I asked some other types of questions, the only possible answer could be YES! YES! YES! They didn’t want to get me sad. When in class 5, now with the Tablets, it was was amazingly simpler. 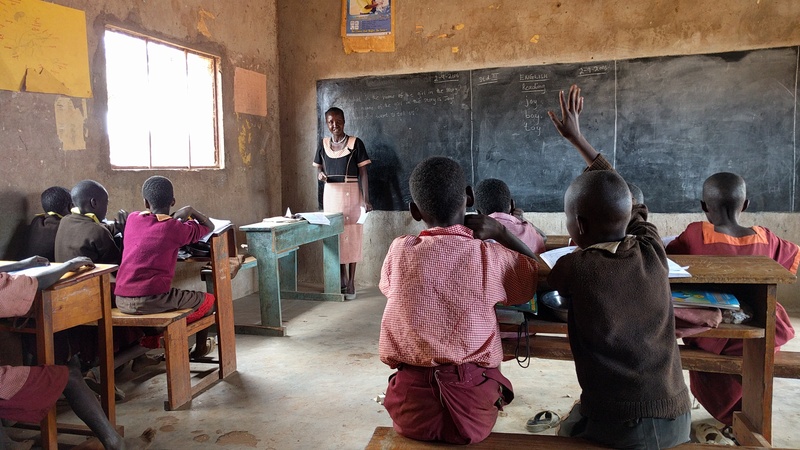 In this class, the children were calling me all the time to teach them something, and they were really excited to get a mzungu teacher. Their English was a lot better so I decided to read with them some English Story Books from the app. Each of them read one paragraph, just as I did in school. I made some questions about the story and asked them to draw what they remembered. What I saw the teachers normally doing, is ask the students to repeat the words in the story. They can do this well. That’s the way the teachers usually gets feedback if the kids are learning or not. It’s definitely a harder job to check their comprehension of what was said or read, or if they can put it in other words, but to develop this skill is the first step to build a critical mind. I suppose once there is this feature on the app, with proposed questions for each exercise, or the possibility of the teacher to develop their own questions, students will learn better and teacher will find their job easier. During this expedition, I realized something I already knew but wanted some proof. 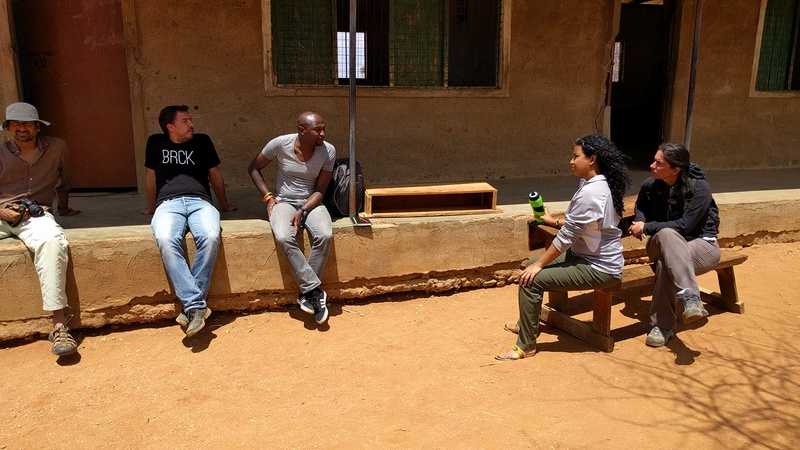 The impact the Kio Kits are bringing to this community is hard to be measured, but is huge. All the content inside one small tablet, the opening of possibilities in the children’s minds, interactivity, learning by playing games, curiosity, all this with no connectivity needed. Each time, we are learn of our capability to improve society. Day 0 comes before Day 1, and what a Day 0, traveling to the Kiltamany! The original plan was to leave for Kiltamany at noon, but that was not to happen. Facebook’s Mark Zuckerberg, passed by BRCK office much later than expected and got the whole building excited. 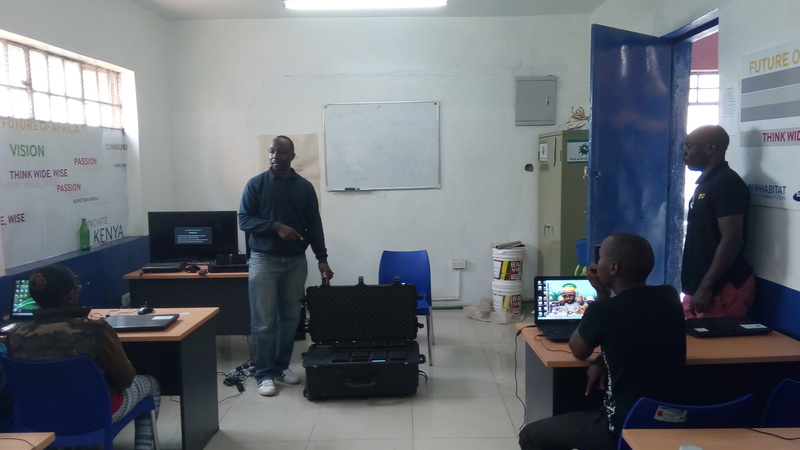 In the process, he took a great photo of himself and our Mark Kamau, with the PayGo/PicoBRCK project, which he posted on Facebook. 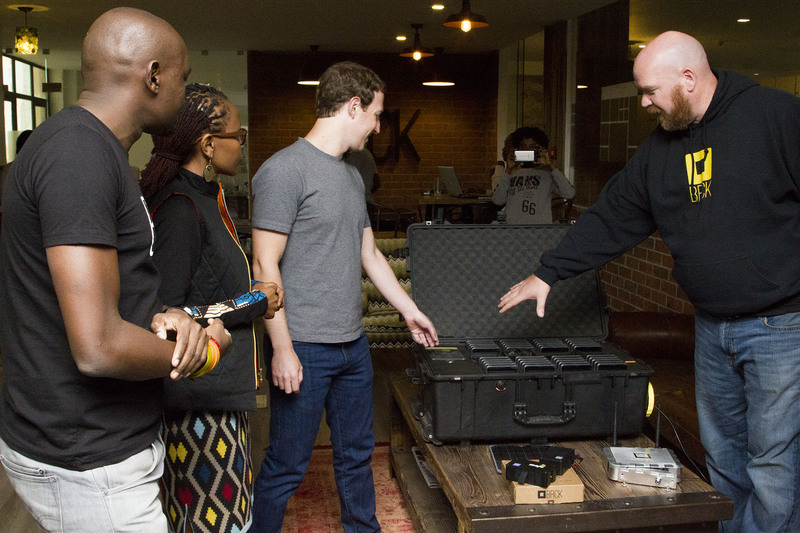 Of course, BRCK’s Mark suddenly regained numerous Facebook friends, tags, posts and likes – rising to celebrity status. But this meant that by the time Jeremiah, the BRCK Intern, Mark and myself finally rode out of the office, it was 4:45pm! Trying to negotiate the fastest route outside Nairobi, BRCK’s newly, freshly minted ‘celeb’ aka Mark got a thousand times humbled by a no-nonsense traffic cop. 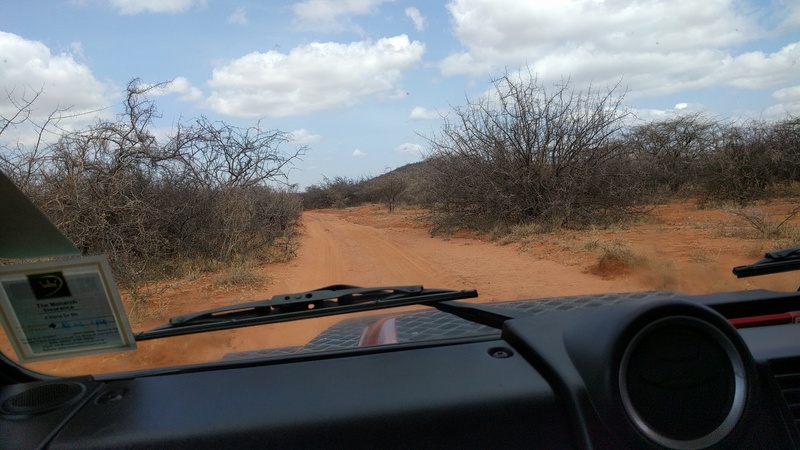 Google maps said it would take 7 hours to reach Kiltamany, Samburu County. However, there is a 20km section between Archer’s Post and Kiltamany that weaves through a conservancy full of acacia, lost trails and dry river-beds – an impossible feat in the dark. So we set our goal lower for that day: to reach Bryan’s place in Nanyuki, and proceed to Kiltamany the following morning. Mark’s hard-driving and google-map-defying navigation, consistently interrupted by homage from Facebook fans, got us to Nanyuki by 9pm. After a night at Bryan’s excellent house in the middle of another conservancy among zebras, warthogs, bushbucks and other wild game, we set off for Kiltamany in the morning just after 7am. The ride to Kiltamany would have been smoother if we had not argued about google maps correctness. Ultimately, there was nothing to argue about once we went beyond existing, data-rich, cell towers! We reached Kiltamany Primary school a few minutes after 10pm, and went directly to join Nivi, Edoardo,Elimu’s Francesca. 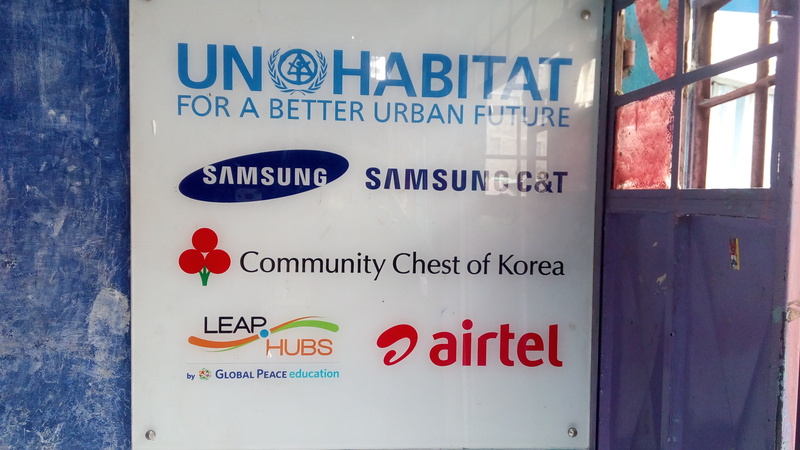 Initially, we distributed ourselves among the 5 teachers classes. Afterwards, Nivi and Jeremiah volunteered to teach some classes, with and without the Kio Kit. My Standard 8 math class was taught by the head-teacher, Mr Elijah. It was a normal well-taught class, to an attentive 12-some boys. The class was quite interactive. It reminded me so much of my primary school days. However, they appeared way behind in the syllabus, for a class sitting the KCPE in a month. My other class was a group of Std. 3, girls, more in the group than boys. It was passionately taught by a Ms Elizabeth. With only 5 teachers, it means that the other 3 classes go un-taught at any given time. 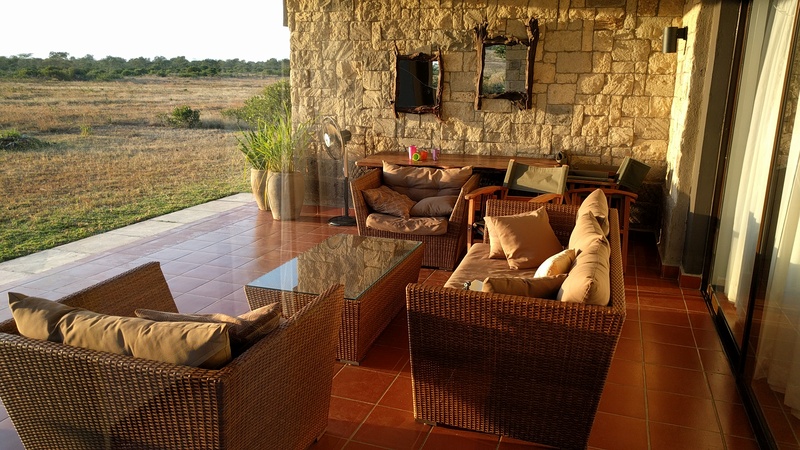 Kiltamany is about 20kms from Archer’s Post deep, inside Kalama Conservancy, very far from Nairobi. As you can imagine, not many teachers posted there take up their appointments. I can foresee the Kios playing a major role in complementing the work that the teachers do. 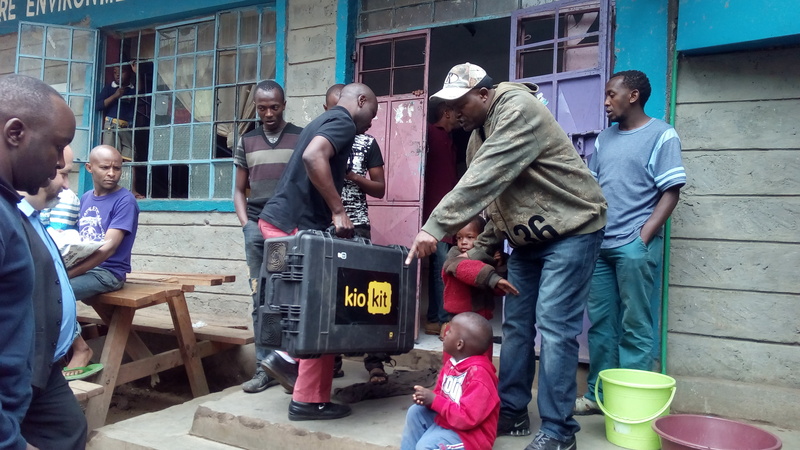 Nevertheless, Edoardo and I were delighted by the Kio Kit’s WiFi performance. The almost zero WiFi interference meant that the Kios could be used upto 50m away from the Kio Kit! Streaming on the Kios worked so well from the neighbouring classrooms, giving flame to Edoardo’s ideas of broadcasting to groups, registration of students and the sessions. There is also decent 3G signal at some points of the school, which will ease the task of remote updates. It’s day one, but I think it has been worth it, at a technical level. We spent the evening sprucing up the camp, taking showers (for some), and helping prepare dinner. Amit wowed us with burgers, fries potatoes and most delicious fried onions – that everyone agrees – belongs to the best Nairobi restaurants, not a camp in Kiltamany. At some time, the Samburu elder guarding our camp left to attend a meeting to discuss a hyena attack, that had claimed the lives of 90 goats just the previous night. They are now back, but there was also a hyena scare near the camp last night, so here’s to hoping that this hyena business has been laid to rest. To keep up to date with this trip, check out our Facebook, Twitter and Instagram pages. On a chilly but warm Monday morning of June 20th 2016, Rene John Dierkx and I embarked on a 4 hour road trip from Lilongwe to Blantyre to deploy a Kio Kit purchased for Noacha Full Primary school by UNICEF. Rene is an Education specialist and Architect at UNICEF who has worked in Africa for many years. As we chatted away during our journey I was amazed by the well maintained tarmacked roads, the warmness of the country and the lack of crazy traffic on a Monday morning! To me, Malawi was living up to its nickname – the warm heart of Africa. Malawi is a landlocked country in the Southern African region and is among the world’s least developed countries. About 85% of the population lives in rural areas and the economy is driven by agriculture. At around noon, we arrived at Noacha Primary School which is located in the outskirts of Blantyre. The school has over 5000 primary school pupils. Although the school has about 90 teachers, it does not have enough classrooms and learning resources. Each class has an average of about 100 students and there is a severe shortage of textbooks, exercise books, and even furniture leading to some classes being held out in the open. Rene, being an architect, is monitoring a pavilion for the school which will serve as a learning and social resource centre. He has initiated a project called Living Schools that seeks to empower children to become thinkers, designers, and makers. Through this initiative, the school has implemented some fantastic projects such as tree planting and helping out in the construction of the pavilion. 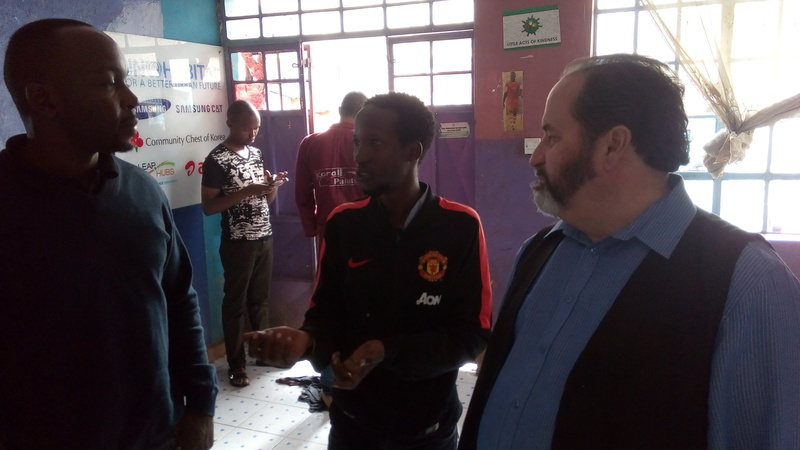 These activities will enable the children to reach their full potential, and I’m proud that the Kio Kit is a part of the project as a learning resource. When we arrived at the school, we found the morning teachers winding up their shifts. 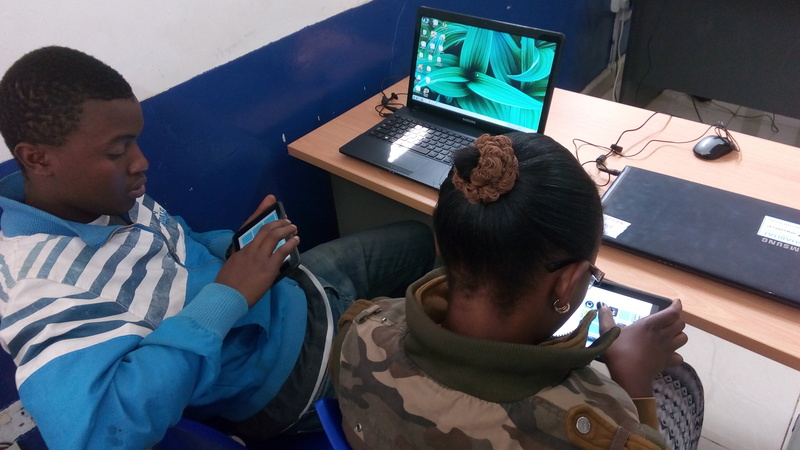 About 10 teachers agreed to remain behind so that we can train them on the Kio Kit – our fully integrated education solution that turns every classroom into a digital classroom. The reaction was amazing! The teachers were all excited. All the hunger pangs were gone and we ended up having a full afternoon training session. 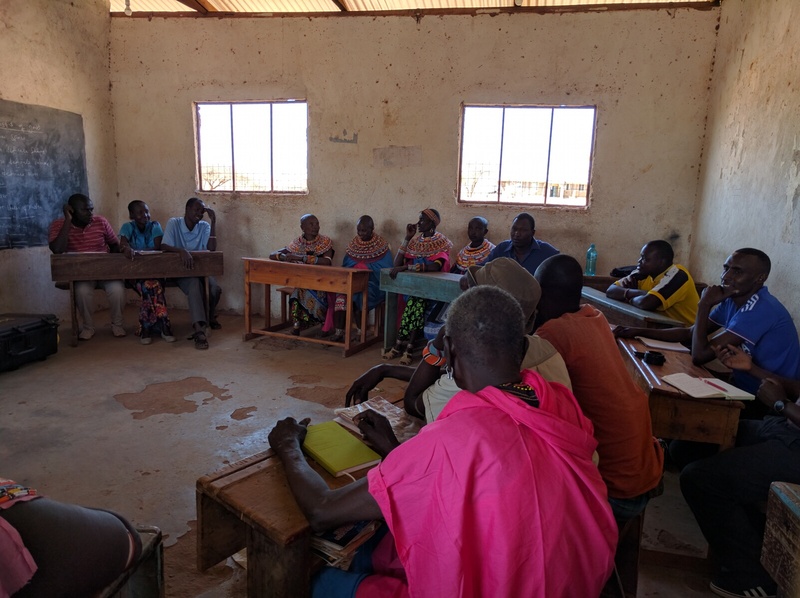 Due to time, we agreed that we’d continue the training the next day to include the other teachers as well as utilize the Kio Kit to teach a class. On day two, teacher Gertrude was well prepared to teach her class 6 class science. Her topic for the day was living plants and with my help we selected appropriate topics from the Kio Kit. She selected a topic on plants from eLimu and was very excited that it had the exact illustrations and explanations that she had in mind. In class she introduced the topic using chalk and a blackboard and then gave step by step instructions to the class on how to find the topic in the tablets. Due to the large number of students, they had to sit in groups of 4. After about 10 minutes of working in groups, the picture below speaks a thousand words on what happened when she asked questions. Everyone raised their hands ready to answer questions. The only other resource that she had apart from the chalk and blackboard was the Kio Kit. After class, some of the feedback I got from the students were, “it makes learning fun, I understood the subject more” etc. 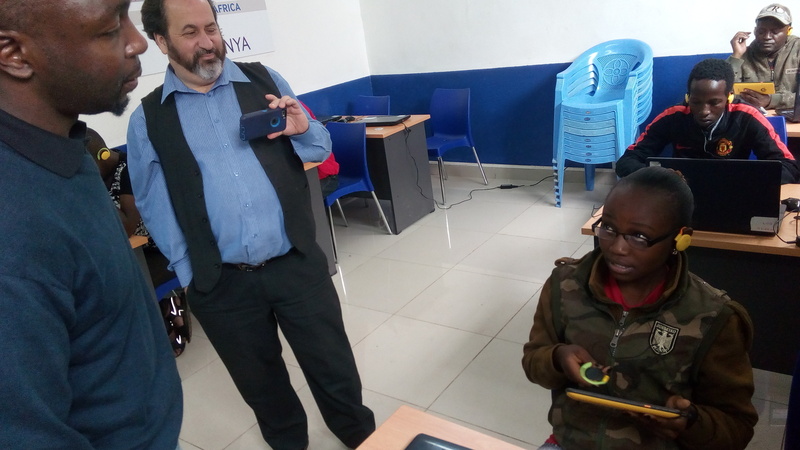 Feedback from the teachers were, “it made teaching easy and fun, they were happy that they were the first school in the region to access digital technology, it helped them solve the issue of lack of textbooks” etc. 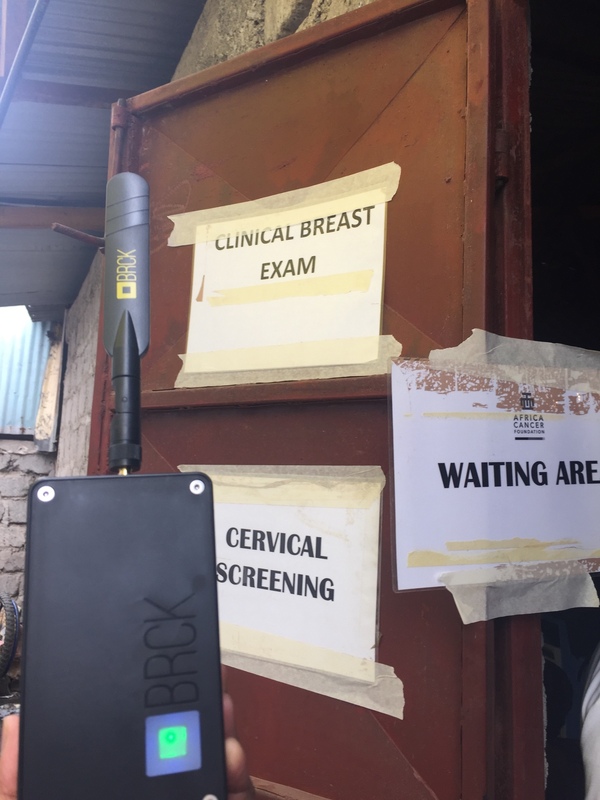 At BRCK, we do not just create technology but we design and engineer solutions that make a positive impact in the society we live in. Over 400 million children around the world do not have access to basic education. Our vision is to enable millions of children in schools across emerging markets to access digital education tools for better learning. Schools like Noacha and partners like UNICEF only help us reiterate our mission of providing quality education to all children around the world. 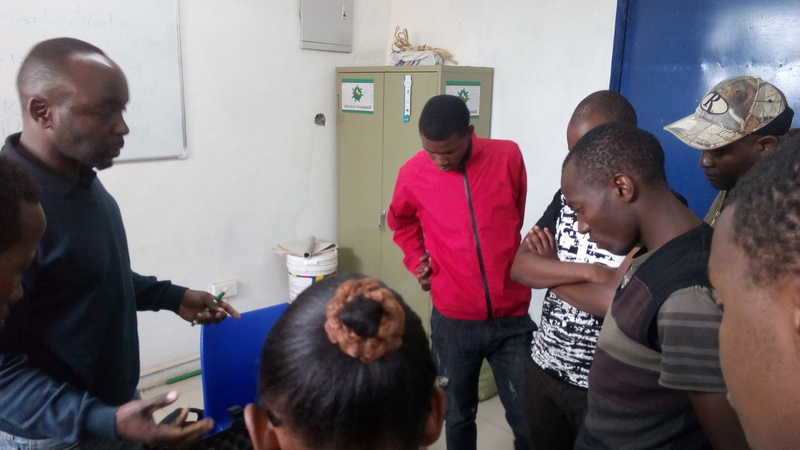 Last Friday we were in Mlango Kubwa in Mathare to give a demo on the Kio Kit at the Mathare Environmental Conservation Group (Facebook page), a UN Habitat and Samsung C&T-funded youth self-help organisation. Doug Regan, one of the directors of the program, invited us and the reception was warm. 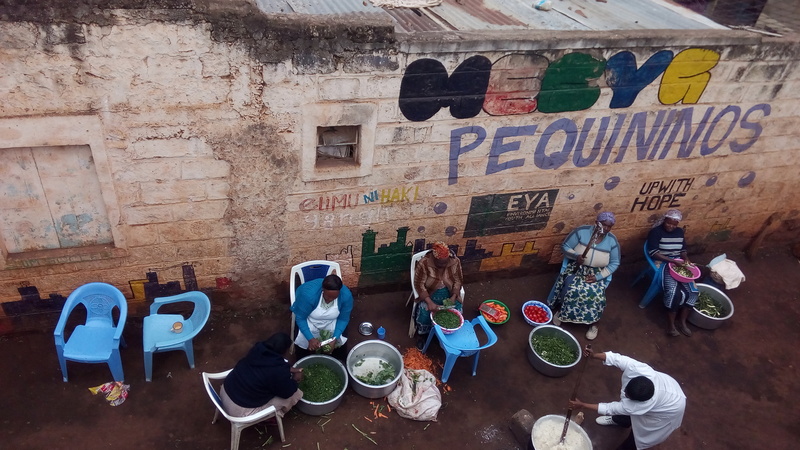 Mathare is an informal settlement located on the eastern side of Nairobi and has a population of at least 500,000 people. 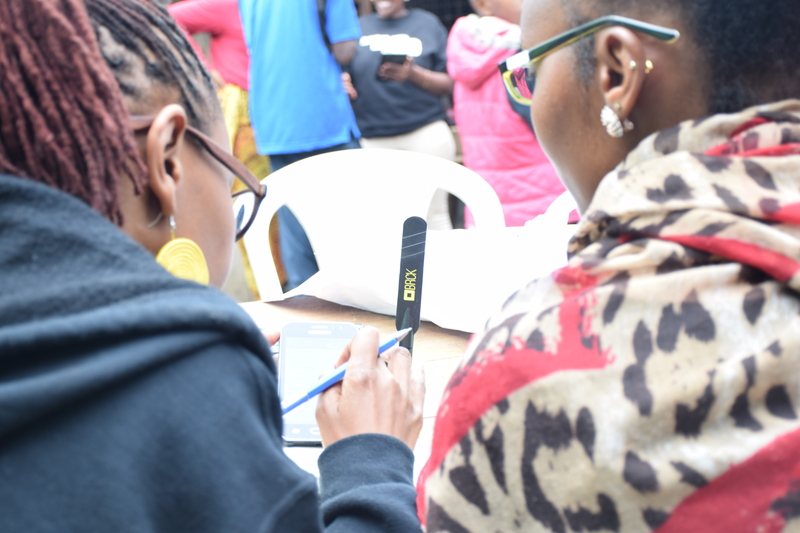 The Kio Kit is designed to be intuitive and easy to use, a fact that was proven again when the youth at the centre took to it fast. It is a wonderful tool for learning and outreach programs. 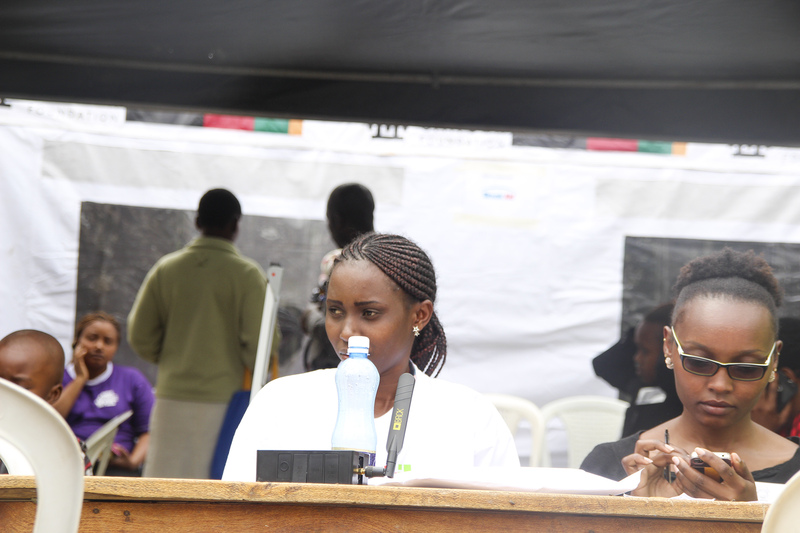 Isaac Mwasa, the chairman of the centre, was especially excited about its potential for civic education. There are plenty of pre-loaded materials about this and other subjects on the Kit. 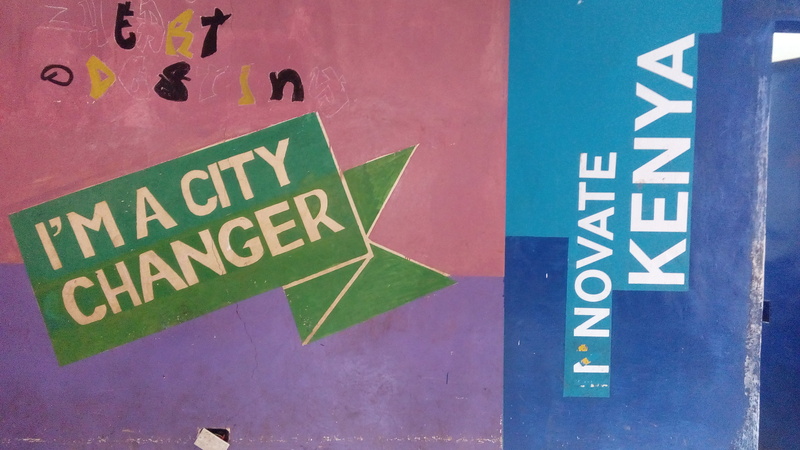 In addition to being a place where young women and men can learn marketable skills, the centre runs a National Youth Service (NYS) feeding program, which is an important aspect of community outreach programs, and has a program for recycling plastic, which generates income and keeps the neighbourhood clean. If you would like to partner with us to make a difference, like what the youth group is doing, send us an email at [email protected] or [email protected]. Written on the wall is “elimu ni haki” (Education is a right). Everyone in the technology sector has done field work. Visits to customers homes or offices to fix loose cables, mount antennas, install kitchen equipment, and to carry out regular maintenance are part of it. Sometimes, it is to touch base and find out how clients are doing and how you could make their lives easier. Others, to dismantle an installation and end a service, or check for the viability of a product or service. We do field work all the time here, with The BRCK Expedition being the clearest example. One of our (less-enforced) rules is that whenever you go out of the office on BRCK work, go on leave or travel somewhere new you have to carry a BRCK to test and take photos; otherwise, you did not go. It is exciting and nerve-wracking at the same time. You meet new people, and see how your gadgets perform in the wild. In some cases, you climb tall buildings and experience the panoramic view of a town that those heights afford (anyone who has worked with antennas has done this). Most importantly, you learn how to troubleshoot and configure devices on the fly and think on your feet. The feeling of accomplishment at getting people connected or making their lives a bit simpler and seeing the satisfied smiles on their faces is unlike anything you could ever feel. It is the warm glow of doing a good job that matters. 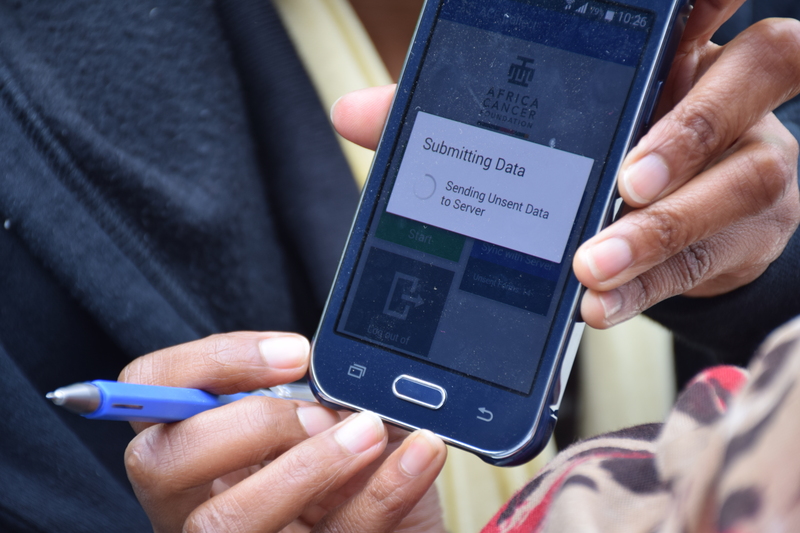 The best part of field work, aside from experiencing the impact of your products, is to gather feedback on what to improve. Field work validates or invalidates your assumptions about your product’s reception, usage, and performance. The office is an ideal testing ground since all the conditions are under your control. The field is another matter. It is the perfect testing ground. Incorporating the takeaways and test results into your product or service is a big step in building a usable, reliable and relevant solution. Growing up in Kenya it was common to see in many households OMO as the first washing powder, so much so that OMO was used to mean “detergent.” It was not surprising to hear children at kiosks asking the shopkeeper for “OMO ya Sunlight” or “OMO ya Toss.” Such was OMO’s influence. OMO is an acronym for Old Mother Owl. This name brings to mind wisdom and nurturing care, connotations which are not accidental. Certain factors made it possible for OMO to have such a significant impact. It is not that there was no competition. There was Persil, Orbit, and Sunlight. OMO had first-mover advantage. According to the Unilever website, it was introduced in Kenya in 1953. By the time similar products had hit the market, it was a bit too late. OMO had also garnered mass appeal from a favorite quiz show called OMO Pick-A-Box. It was a Sunday-night staple of every household. By the end of the month, and thus shopping day, OMO was the only thing on almost everyone’s mind as far as a detergent was concerned. You may wonder what a short history of a traditional soap and its marketing might have to do with educational solutions built for the periphery. 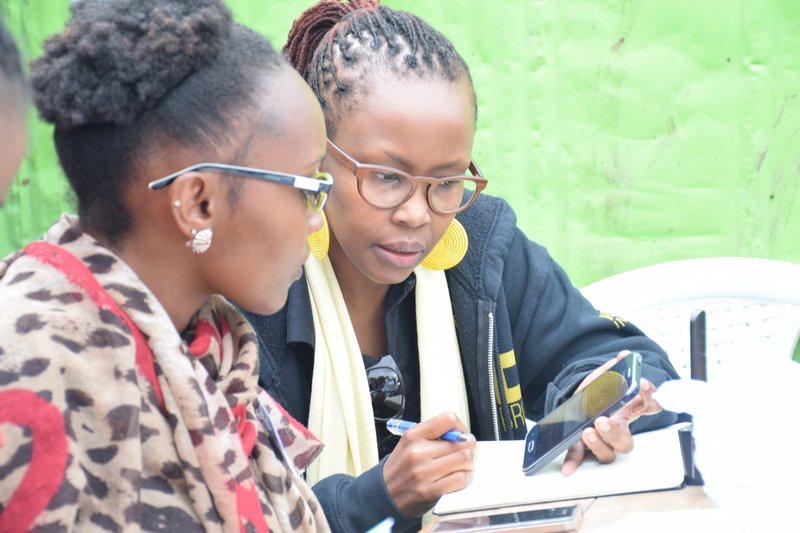 During the 2015 BRCK Expedition, while we were at Kiltamany Primary School, an interesting thought occurred us: this was the first time a lot of the people there were seeing and using tablets. Not just any tablets, but bright yellow ones with the word “Kio” at the back. Like OMO, it is a simple, easy-to-remember two-syllable word that captures the imagination. It would be a welcome thing to have our product synonymous with tablet computing, and thus digital education. We could work on this aspect of our brand to ensure that in every country the Kio Kit is shipped to, any similar devices will be referred to as Kios, much like quite a few of us call non-Apple tablets iPads. That kind of brand recognition would put us miles ahead. But, we would be putting on a show, instead of striving to build something that makes a positive difference to pupils and teachers in remote areas. The attention that we garner has to come from a sincere and honest place. We want to hear teachers telling us how the Kio Kit has made their work easier. We want to see children’s eyes going wide at the prospect of using a Kio during class, and we want to see their grades getting better because of the Kio Kit. We would like parents to let us know what an improvement The Kio Kit has made in their children’s lives. Awareness about us has to come from being genuine and building relevant products. We have tested The Kio Kit extensively. We go for expeditions, not merely for the fun, but to put our products out there and ensure they live up to our brand’s promise, that it will work in the places we claim it will work and in the way we guarantee. 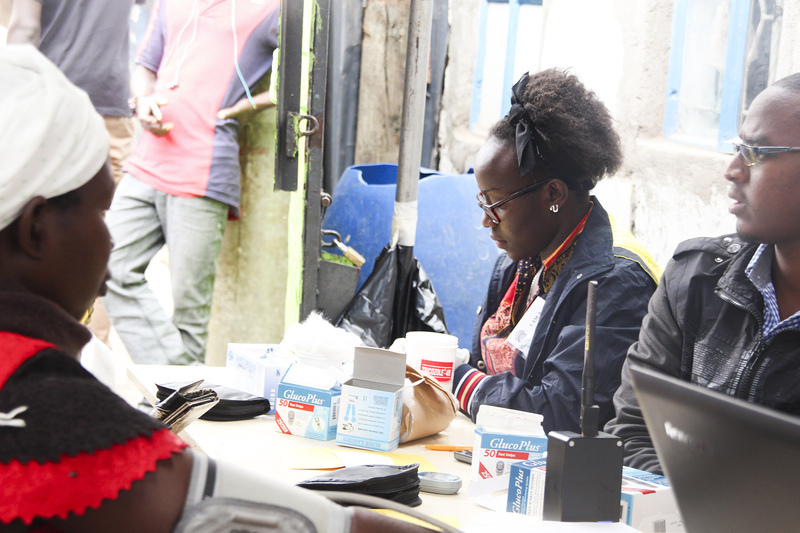 We have also tested the Kit in schools in and around Nairobi and not just in exotic locations. 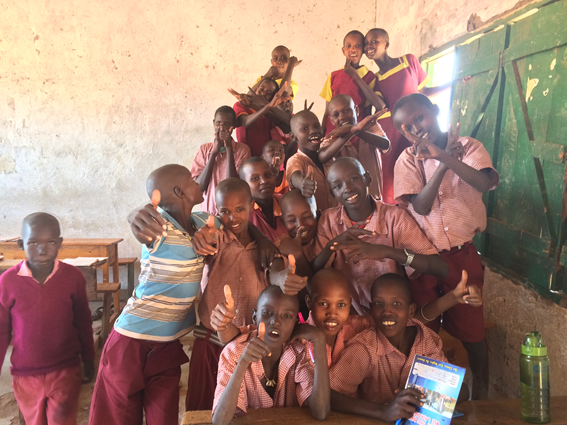 The value that the Kio Kit can deliver goes for both private and public schools. Partnering with content publishers such as eLimu and Pearson ensures that we provide the most up-to-date and relevant learning materials. OMO is still in great ways interchangeable with laundry washing. The word “Kio” is a play on the Swahili word “kioo” meaning mirror. The Kio tablet (and Kit) is intended to make you see your potential, what you could become. We do not just imply this. 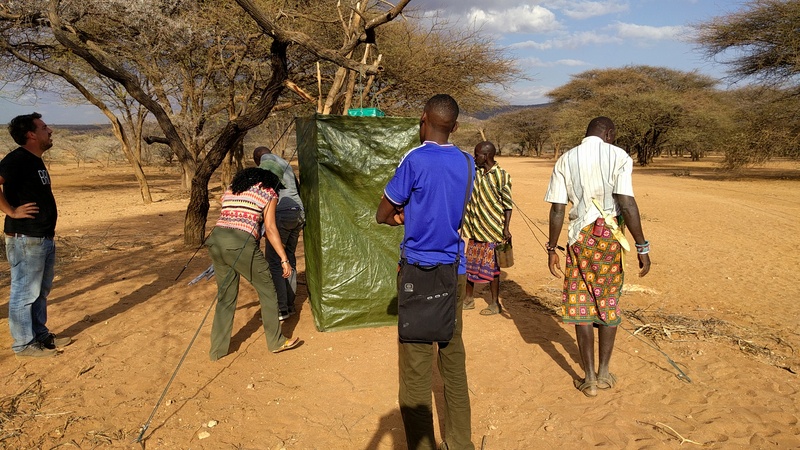 We firmly believe that making learning devices and materials easily and affordably accessible to children in the remotest regions of the country (and the world) will put them on a better footing with their age mates in more affluent and well-developed areas. The Kio Kit is the best solution for this.